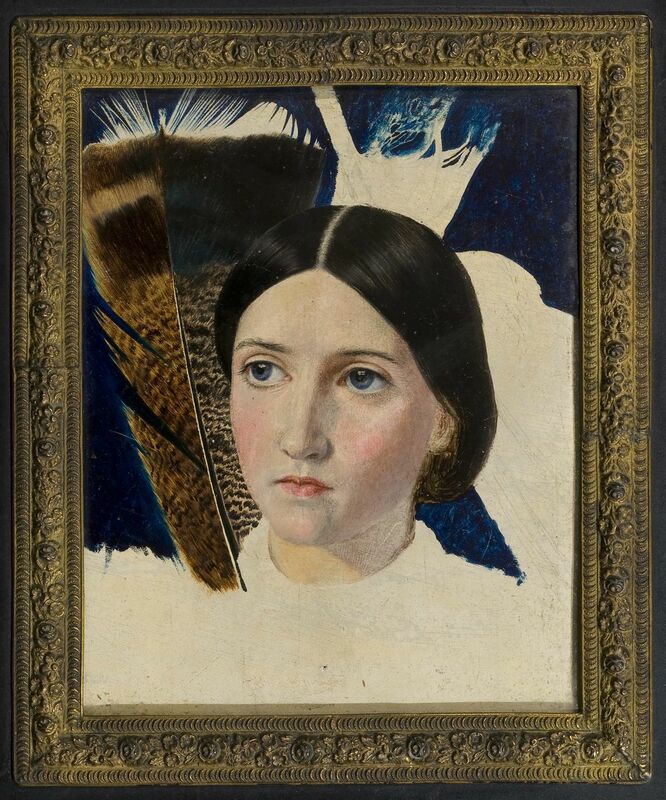 Small yet striking, John Brett's portrait of Christina Rossetti is a highlight of Watts Gallery's latest exhibition, Christina Rossetti: Vision & Verse. Depicting Rossetti at the age of 26, this work is a rare portrait from Brett, best known for his Pre-Raphaelite inspired landscape paintings. It is believed that the pair first met in Surrey in the summer of 1857, when Christina visited the Epps family home in Warlingham, where Brett regularly gave drawing lessons to the Epps sisters. The meaning of the large feather in the background of the portrait remains ambiguous. The most recurrent interpretation suggests that this feather represents a quill pen, alluding to Rossetti's status as a poet. Brett's panel, in its small scale and intricate detail, is reminiscent of a portrait miniature. Historically portrait miniatures did not just replicate a person's appearance but were often used as intimate keepsakes, exchanged to signify close relationships. This notion resonates with Brett's portrait of Rossetti, in light of the suggestion that the artist and poet may have once been romantically involved. In March 1860 Rossetti wrote the poem 'No, thank you, John', in which a female narrator rejects a persistent male admirer. Debating the identity of 'John', the hapless suitor of the poem, Christina's brother William Michael wrote that he believed him to be the 'marine painter John Brett', who had been 'somewhat smitten with Christina'. Author and biographer Violet Hunt later claimed that Brett had confessed that his proposal of marriage had been rejected by Rossetti. Despite leaving the work unfinished, the panel remained in Brett's possession until his death in 1902, enhancing the romantic notion that this portrait of Rossetti may have been kept as a personal memento of unrequited love.